Ever wonder where the idiot in the rental car in front of you might be from? Here is a handy guide to American driving styles. Just as when you talk with someone, you can usually get a good idea of where they're from by their accent, so it is with driving. The United States is a big space with a fair number of people within it. Just as our voice accents denote our geographic origins, so do our driving habits. Having been a long haul truck driver covering all 48 states of the continental United States, I learned some of these habits. Doing this taught me that wherever you go, there are bad drivers. Some places worse than others, sure, but every place has its nuances. In Los Angeles, driving is mainly about patience. In New York, it's mainly about aggression. On the West Coast it's mainly about multitasking. In Texas it's all about size. So here are the easiest ways to tell where the driver in front of you might be from, even if their license plates claim they're local. 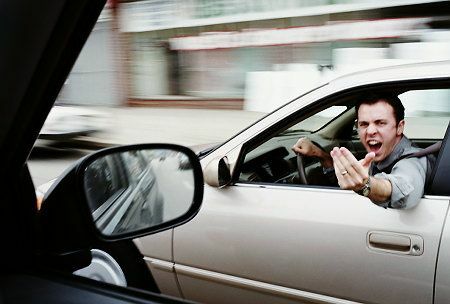 One hand on the wheel, one hand out the window giving rude gestures: New York. No group of people have mastered the art of the universally understood rude gesture quite the way New Yorkers have. It's guaranteed that when the vehicle is not moving, the hand that would be steering is either adding to the gesture or honking the horn. Qualified outbursts (often in broken English) will usually accompany the gesturing. Another dead giveaway that the driver is from NY is that the window will be down no matter the weather. Like the Post Office, nothing stops a New Yorker from delivering that gesture to the world at large. Bonus: If the driver has all of the above AND is cutting across lanes of traffic like a NASCAR driver aiming for the inside lane.. he's from New Jersey. Shotgun mounted in rear window, dead animal parts festooning car, beers cans randomly flying from open windows: West Virginia. Amazingly, the stereotype of having a lot of missing or snaggly teeth doesn't hold anymore, but the other things that make WV what it is still exist. The truly amazing part is that with all of these violations of law, West Virginians also have a knack for never getting pulled over. Despite making triple lane changes in an attempt to hit a deer, the habit of throwing empty beer cans out the window when finished with them, and the penchant for screaming "YEEEEHAWWW" out the window randomly, cops seem to give them a pass. Probably because for all that, they're generally harmless. Two hands atop steering wheel, no other body parts visible save for blue hair just over the dash line, driving at 1/3 the posted speed limit OR 100% faster than given limit: Florida. Of all the drivers listed here, these are the most obvious. Another tell-tale sign is the continually-running blinker, despite there being nowhere to turn to or any attempt to make a lane change in hours. Most Florida drivers will be in very large, four-door, domestic-made cars. The Buick emblem is usually an identification clincher. One hand on wheel, one hand holding a script, double-decaf latte balanced on dashboard, cell phone clamped between shoulder and ear: Los Angeles. Nothing says "LA" quite like a Prius driven by a bleach blonde lunatic who's doing everything but drive the car. Amazingly, those who live in the Valley can get away with this because, well, most of your drive time is just sitting around waiting for something to happen anyway. "Driving" in Los Angeles is a relative term, since most of the time, the vehicles are running, but not actually going anywhere. Everyone who lives in LA knows that the only reason to get on the highway to "drive" is to be seen by others, not to actually get anywhere. So the busier you look, the more successful you'll appear, and the more likely you'll be to "get noticed." If you actually need to get somewhere, take the bus. No hands on wheel, weird gadgets strapped to car, smart phone and/or tablet in front of face, open notebook computer in passenger's seat: Silicon Valley. Give a geek a car and it's sure to have some modifications made to it. Give a car to a whole building full of well-funded geeks and you get something with "Google" painted down the sides and a lot of hardware and antennas poking in every direction. Even when out of their home territory, those from Silicon Valley can't help but take perfectly normal cars and add a lot of extras to them. A roving hotspot on the freeway is a dead giveaway, by the way. No hands on the wheel, one hand holding a Starbuck's, the other holding a smart phone, tablet in lap, notebook computer open on passenger's seat: Seattle. Sure, this could be Silicon Valley, but the dead giveaway is the Starbuck's. Nobody who is "in" in California drinks Starbucks. In Seattle, it's practically a state law that you do. Occasionally, they will pull over for no obvious reason and stop to "reboot." They often get stuck at lights when their car "crashes" as well. The "blue screen of death" emanating from the passenger's seat will be an obvious giveaway. One hand on the wheel supporting the daily newspaper, no apparent braking ability, no regard for surroundings: Boston. Drivers from Boston, Massachusetts are a singular bunch. They are possibly the most suicidal of all the drivers in the nation. While others with a self-destructive bent will often scream as they two-fist the steering wheel and attempt to go out in a blaze of glory, Bostonians just don't give a #$%!. They'll nonchalantly ignore all of the safety violations and near-death experiences going on around them and will only rarely look up at the world outside of the windscreen to get their bearings and adjust steering accordingly. One hand on the wheel, the other continually honking horn: Chicago. Sure, there are other places where this is a phenomenon, but people in the Chicago area have made it into an art form. Watch for the near-emotionless, almost dead looks of the driver who's slamming the horn like she's paid by the honk. The opposing calmness and anger release are frightening and a dead giveaway that the driver is from Chicago. One hand on the steering wheel, one hand on a scoped rifle, slows down considerably in the dark: Texas. Texas is huge, wide open, and flat. This seems to have only affected one aspect of the Texan's driving habits: which choice of firearm to bring. It's also apparent that Texans are, as a group, afraid of the dark as they have weird speed limits that change when the sun goes down. So Texas drivers will often drop speed considerably just because it's dark out. Also watch for the wild exit patterns from the freeway, as in Texas, everything is bigger.. except off ramps. Home to some of the nation's worst drivers, Denver sports a huge crowd of people who, despite living in one of the prettiest parts of the nation, are continually out to get one another. Part of this is the horrible freeway design and a flair for useless "roundabouts" and roads that alternate between being in excellent condition to making Alaska look well-paved - often on the same mile of the same road. Contrary to popular belief, despite the ski racks, most people in Denver don't ski or even go into the mountains. What's the point of driving even further uphill than they already are? You'd need oxygen. Bonus: If the person with the ski rack and rude driving habits is in a Subaru and wearing sandals, they're from Boulder. One hand on the wheel, one arm out the window, waves at everyone (even on the freeway), seems nonchalant about breakneck speeds, often slows to count herds: Wyoming. Like Texas, Wyoming is mostly large, open spaces, but unlike their southern wannabe cowboy friends, people from Wyo are used to open, uncrowded roads as well. This makes them alternately friendly and suicidal when they're out of their element. Used to driving at whatever speed they'd like, whether the road is two lanes or ten, people from the open plains are also happy to see other drivers out enjoying the day and will give a "cowboy wave" to everyone. I have not laughed this hard in a real long time. You rule.